You know the difference between something that is plain, and something that is extravagant? Plain is good. Taking something that is plain and turning it into extravagant takes time, energy and attention. Consider matza. Do you know what matza is? Sure, it looks like a cracker. Kinda boring. But tasty! Why do some churches use plain, flat, crackers, matza, like this for communion at the Lord’s Table? Where did matza come from? The idea for matza, unleavened bread, came from God. When God’s people were imprisoned in Egypt, they wanted more than anything to be free! Well, God heard their cry’s for help and sent Moses to lead them out of their prison! But, Moses told them, we gotta go! Now! You can’t delay. They didn’t have time to bake bread. Waiting for wheat and water to mix, blend, and be kneaded into dough, it must then wait for hours as it rises. Waiting. Waiting. Then it has to bake in the oven. More waiting. Since they couldn’t wait, they took their flour and water, rolled it out thin, then baked it in ovens and on hot stones. It didn’t take long. Matza reminds us of how God quickly freed us! Here at our church, we improved on plain matza. Take a look. We have the tastiest communion bread anywhere, its like Scottish shortbread. We are so excited that God loves us, that Jesus leads us, we upgraded matza to Scottish communion bread! But there’s more. 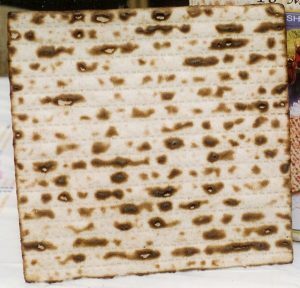 Because God loves us in extravagant ways, what would matza look like if it was even more extravagant? How about chocolate-dipped Matza?! Yeah. Amazing. Here. Try some. Remember that God’s love in Christ is extravagant. God doesn’t hold back. Beyond measure. There’s nothing plain about God’s love. You can enjoy these specially dipped matza that Melissa made. After worship, would you help me offer these extravagant matza to everyone else? Great! God’s love: Extravagant! Let’s pray.